Scouring Space for Life: More Earths Out There than We Thought? Planet hunting is by far the hottest area of astronomy these days, and just about everyone who's in on the search is looking for the same thing: a distant world where life could exist, at least in theory. That means a world more or less the size of Earth, orbiting its parent star in the habitable zone  the location, just the right distance away from its sun's heat, where water can exist in liquid form. Size or distance alone aren't good enough: an Earth-size planet that's too hot or too cold probably couldn't support life, and a giant gasbag like Jupiter couldn't either, even if its temperature were ideal. It's a pretty strict set of requirements  but maybe not as strict as scientists have assumed. Two new studies, one purely theoretical and the other focused on a known exoplanet, suggest that planets that would on first blush seem too cold to harbor life may be balmier than expected. That means the habitable zone could be a lot wider, and the prospects for alien life more favorable, than anyone thought. In both cases, these insights come not from the science of astronomy but from atmospherics  and that's not really so surprising. Without the greenhouse gases carbon dioxide and water vapor to trap heat, for example, Earth would be frozen solid. With an excess of carbon dioxide, Venus is hot enough to melt lead. And Mars, which is technically within our solar system's habitable zone, has such a thin atmosphere that it's too frigid for life (although it was much warmer in the distant past, when its atmosphere was thought to have been thicker). Once astronomers know an exoplanet's size and location with reasonable accuracy, they can turn it over to climate modelers who can create a virtual atmosphere and see how it might behave. 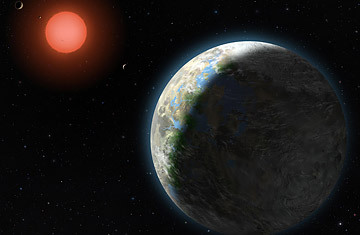 That's what a French team did for the planet Gliese 581d, which orbits a red dwarf star about 20 light-years from Earth. Given its size  about twice that of Earth  581d could reasonably have enough gravity to hold onto an atmosphere, even a thick one. But the planet was nonetheless ruled out as a site for life since it probably has one face turned permanently away from its star, the way the far side of the moon never faces Earth. The far side of Gliese 581d would thus be so cold that the atmosphere would freeze out. Beyond that, the planet is too far from the star to get much heat in the first place. But climate simulations at the Institut Pierre Simon Laplace in Paris, reported in Astrophysical Journal Letters, reveal two possible flaws in that argument. First, the light from the star is much redder than our sun's light, which means it would penetrate the planet's atmosphere more efficiently (in our atmosphere, the blue part of the sun's light is diverted and scattered by air molecules, which is why the sky looks blue). Second, winds would distribute heat from the permanent day side of Gliese 581d to the permanent night side, preventing freeze-out. The second study, accepted but not yet published by the same journal, looks at what might happen on worlds that haven't been discovered but whose existence is at least plausible. Lead author Raymond Pierrehumbert, of the University of Chicago, says that for a long time, he's been looking into greenhouse gases that wouldn't condense into frost when they get cold, the way water vapor and CO2 do. During an astrobiology meeting at the Vatican (of all places), he and a colleague, Eric Gaidos, realized that hydrogen would work. "There's plenty of hydrogen around during the protoplanetary disk phase," Pierrehumbert says, referring to the time in a solar system's youth when planets are assembling themselves out of a huge pancake of gas and dust. If a rocky planet is big enough  say, 10 times the mass of Earth  it can vacuum up so much hydrogen that its atmosphere ends up constituting most of the planet. That's the case for Jupiter and Saturn. If a planet is too small or too close to the heat of a star, it can't hold on to the lightweight gas at all. But for a chunk of rock the size of Earth or maybe two or three times bigger, an atmosphere dominated by hydrogen could exist  and the hydrogen's greenhouse effect could allow life-sustaining water to stay liquid. "Whether life could actually exist on such a planet is speculation," Pierrehumbert says, "but the basic story is that hydrogen would keep you warm enough." And in the case of a star like the sun, it could do so all the way out to the orbit of Saturn. For a red dwarf star like Gliese 581, the habitable zone could extend six to eight times farther out than 581d, which conventional wisdom says is just on (or now, just inside) the outer edge of survivability. As Pierrehumbert emphasizes, neither Gliese 581d nor the hypothetical worlds he's talking about necessarily have life  or are even necessarily hospitable to it. All the new research says is that life on such worlds can no longer be considered impossible. And in the newly emerging science of astrobiology, that's a pretty strong statement.